Want to make a difference? Here's your chance for a meaningful vote for EVs, read below. The MOG is a handsome looking vessel powered by sunlight and embodies the future of modern boating. At the very least, it is the best means of escaping the madding crowd for new destinations formerly reached only by kayaks. 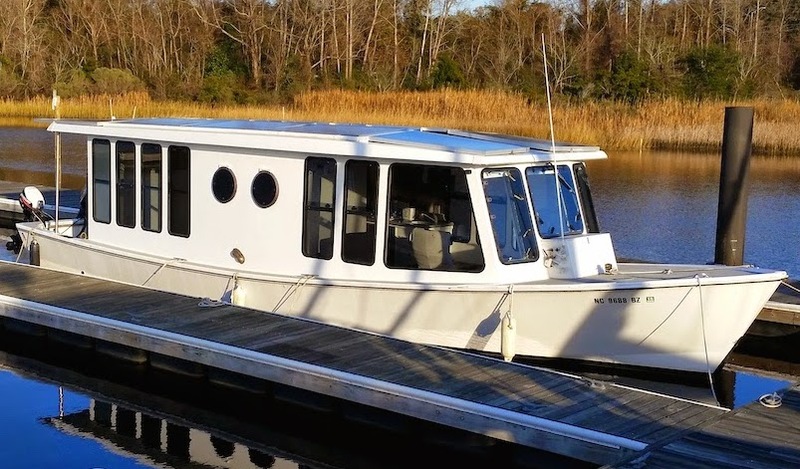 George McNeir, a Wilmington, NC, industrial designer who retired from a career with computer companies deeply rooted in computer aided design and manufacturing (CAD-CAM), has privately built the Mog Canal Boat, a quiet, cost-effective and environmentally friendly option for water travel. The “MOG tm” epithet is an old world word meaning “to proceed deliberately, gently, to depart or decamp, to go from one place to another slowly and steadily”. The Mog Canal Boat cruises at a leisurely sailboat speed of about 3 knots and tops out at a hull speed of 7 knots. She’s not a party boat for the young but a seriously unlimited range vessel with world class applications. Uses such as a mobile laboratory, traveling school, hospital-clinic, mobile marine power generation platform and long term team support vehicle, in shallow estuaries far from resupply of fuel, are but a few applications. Nearly 3000 watts from this small array, full array is over 4000 watts. 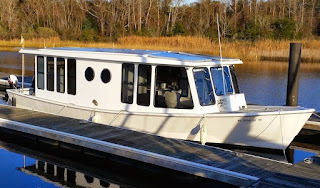 If considered as a cruiser, it would sleep between two to four persons in two cabins with forward convertible settees and queen/twin bed aft that lifts up to create an open floor space. There is a full galley, head, vanity and a separate shower. Also powered by the sun are the standard radio, VHF radios, TV, air conditioning, refrigerator, vacuum cleaner and all lighting. 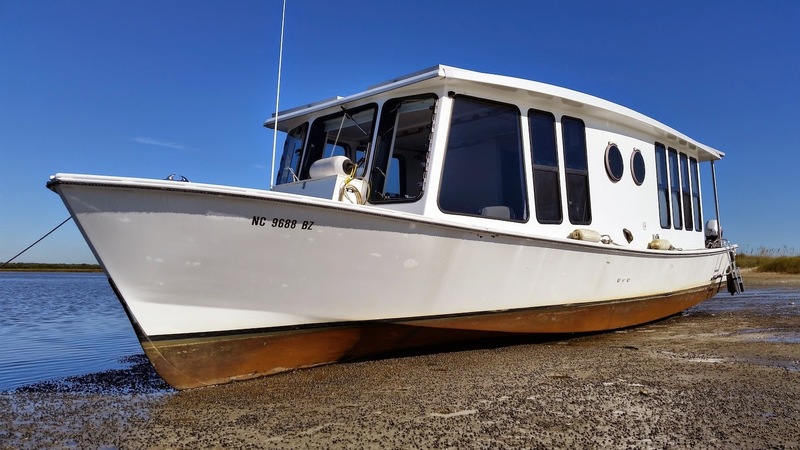 There are plenty of storage drawers, closets, lockers, below deck storage and both galley and head are fitted with pressurized cold and solar heated water. More than twenty large windows surround the spacious interior environment, yielding huge breathtaking views while protected from the sun’s UV intensity. Screened windows allow pleasant breezes to waft throughout the boat as well as real air conditioners for those very hot and muggy days. 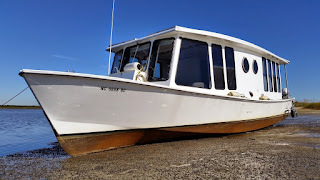 The Mog’s bottom, although flat across the boat's beam, has a very efficient rocker or curve from stem to stern, creating highly efficient progress through the water with a nicely cutting bow. The hull is so efficient, that when compared to other monohulls or even catamarans, there is barely a wake to be seen. The hull form presents an incredibly shallow draft of only 18 inches, not even knee deep, allowing it to camp out on beaches and islands along the way. This hull shape plus the fact that the range is truly unlimited, heralds a completely new application skill set for the captain and crew. A skill set that is intuitively learned and at the beck and call of any worthwhile application one can imagine. A 10 hp electric outboard motor weighing just 75 pounds! Inboard or outboard electric motors powered by the same solar derived fuel station in the sky, set the vessel into an uncanny quiet motion that handles with ballet-like ease and stops on a dime with nine cents change. Electric motors, with their full torque at zero rpm, can maneuver in a way that escapes the realm of currently employed internal combustion engines (without the fumes and noise too). As for fuel, there is no match. No oil, smell, fire, plugs, freezing, filters, noise and insurance costs plummet. 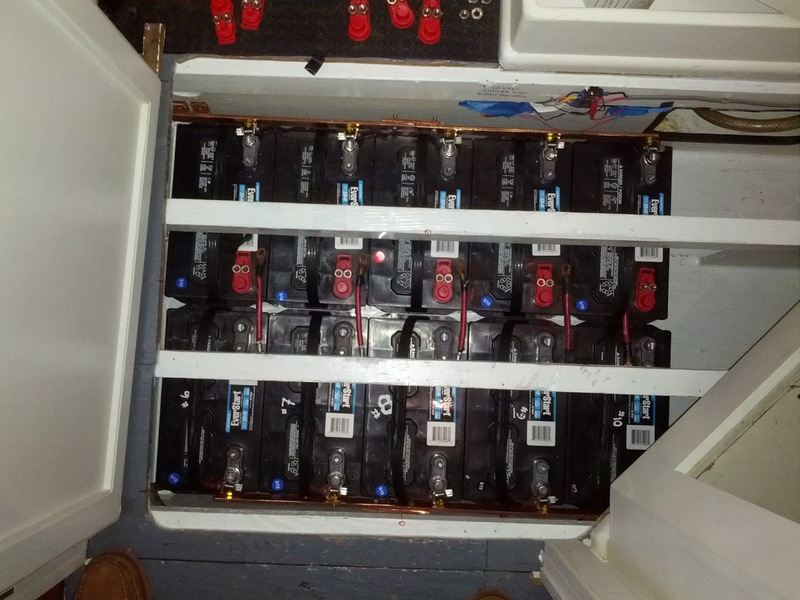 Even lead acid batteries last far longer because of the constant renewal of energy from the sun, even on cloudy days. Ten of the eighteen batteries. New batteries will have 3X the power density. With more exotic batteries the seascape changes even more dramatically, when costs are compared to internal combustion engines. At 2 to 3 miles per hour the vessel can proceed for days without significant sunshine (even at night). On a clear sunny day it is able to venture nearly 40 miles and arrive at the end of the day with nearly 94% full battery banks. Several excursions of 100 and over 500 miles have proven these capabilities. Newer technologies will greatly extend the speeds and distances. After a gorgeous day of travel, create your camp right on the beach. A NASA contest offers a way for you to contribute a vote to further to the EV cause. 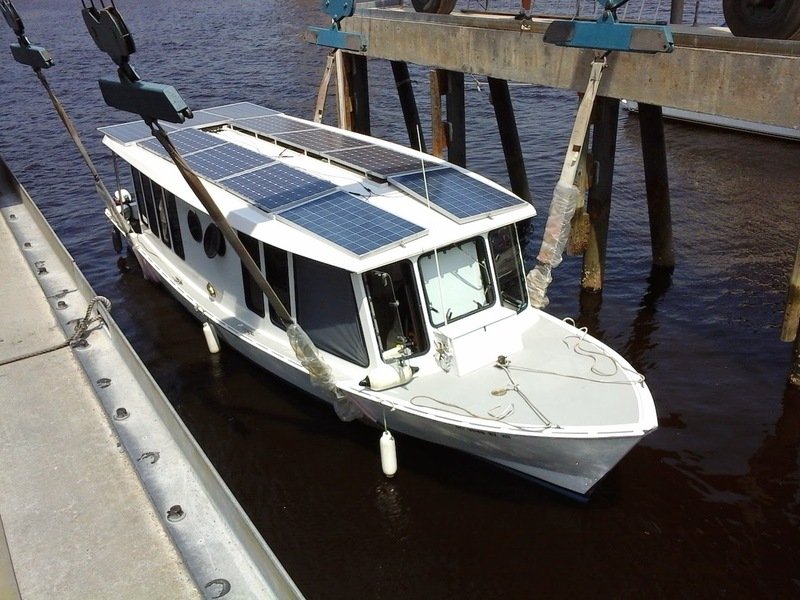 The builder/designer of the Totally Solar Electric Vehicle MOG Boat, has privately built a full size, personal 40 foot working machine. And offers a free license to build these boats to all manner of humanitarian groups. For builders of private/commercial boats, there is a nominal fee. The following contest raises awareness to new EV enthusiasts as well as those who have actively participated in the over 25 year build and demonstration of the MOG craft. Join the enterprise too. The joining of the NASA Tech Pub’s 'Create The Future Contest' entitles the prospective voter to be a member of the CR4 designer’s forum as well as a vote for SEVs (solar electric vehicles). Please read the article and see if this works for you, for boats, as a portion of the Electric Vehicle spectrum. Contest entries are no longer accepted BUT VOTING CONTINUES until September 11th, 2015.